You ever wonder why some snacks stand the test of time in popularity in their original version AND have modern versions that are so amazing, you can't get enough? Popcorn is the perfect example of that kind of snack. So now let's talk about popcorn! Because I have found the BEST place to buy popcorn in Rocklin! I'm so excited about this place and can't say enough about The Popcorn Store located at 6819, Lonetree Blvd. Rocklin. http://thepopcornstoreca.com/ The original store is in Elk Grove (by the way, we own a sister facility in Elk Grove called Harbour Point Self Storage) but I'm lucky enough to live close to the one in Rocklin so that's the only one I can speak to first hand (that hand, by the way, that is grabbing popcorn even as I type). While this location is new, the business is about 10 years old and originally called Vic's Corn Popper. The day I dropped by our Rocklin ground zero of gourmet deliciousness, the two people working there were extremely helpful and informative although I could tell they were jumbo sized busy! Now even without getting into the delicious popcorn amazingness that comes out of The Popcorn Store, let's talk about the shop itself. It's absolutely the CUTEST thing with perfect aesthetics for what it sells. The walls are a nice bright yellow and green color that instantly makes you want to have fun. Various shelves are lined with many of the pre-packaged popcorn products that are both seasonally and occasion specific. There are tins of various sizes to hold all your popcorn needs. Then there's more. I mean way more. There's a whole wall of the most popular flavors that includes caramel, birthday cake, apple-cinnamon, peppermint, pumpkin spice and even hot tamale! Because it was right before Christmas, I had to get their Holiday Blend of golden, green and red popcorn that ended up being PERFECT for my toddler and preschool aged grandsons. This blend was mildly sweet with just the right amount of saltiness to it…beautiful as it was delicious. Popped, Not Baked Is Just as Good! But wait! There's more!!! I thought maybe I'd reel myself in by not going overboard in sweets so close to Christmas Eve. Just as I took a step back away from the amazing wall of all things popcorn, I heard one of the very helpful wizards of popcorn say to the other equally as magical popcorn wizard, "that batch of Cinnabon is done". WHAT!!! Cinnabon popcorn? There went my resolve to reel myself in! I quickly approached the counter and tried NOT to act desperate as I asked in what I thought was a super-blasé way, "DID YOU SAY CINNABON! MUST HAVE! MUST HAVE!" or something equally as subtle. In no time at all (really, I'm talking maybe 30 seconds) I had a bag of the motherload of popcorn flavors in my hand. I quickly paid for my purchases (very reasonable pricing, for gourmet flavored popcorn) and walked to my truck (maybe sprinted) so that I could break into my Cinnabon stash. Every Bite as Good as the Real Deal. It was everything I'd hoped. First, there's every type of flavor note and variety of texture that's in a Cinnabon cinnamon roll. The only difference is trading a bread substance for an airy popcorn substance. 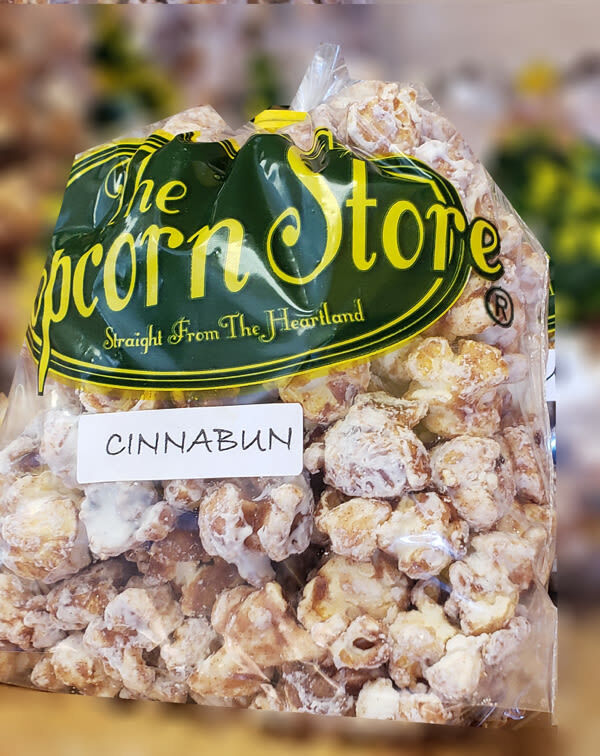 Whether the popped kernel of corn was covered in a slightly hardened caramel coating, a light dusting of cinnamon and sugar, a slightly soft sweeter exterior or a truly magical coating of what tastes and feels like a mix of powdered sugar and cream cheese, everything smacks of a Cinnabon cinnamon roll. Second (but not most important, I admit), the whole thing smelled like a cinnamon roll. It was so pleasant eating something that smelled like what it was copying because nothing smelled artificial. Third (and important, I think) each kernel was popped. In the whole 3 1/2 cups of popped popcorn, there wasn't one dud. Not one un-popped kernel! It was as if the magic just continued to happen. Not only was everything delicious and smelled wonderful but I actually got my money's worth of product! Fourth, it's GMO free and made without any MSG. I'd say that's a big reason to binge on this delicious and mouth pleasing snack. As I mentioned already, the variety in the store is amazing and I can't imagine anyone walking in without finding something they'll love to taste, providing popcorn is their thing. And given their reasonable price point, it's a win/win. White popcorn (which is popped right there in front of you and kept super fresh) starts at $2.00 for a small bag (10 cups of popcorn) and goes up in size/price to the Bin Buster at $17.95 (300 cups)! Flavored popcorns (like that Cinnabon thing I may have mentioned) start at $3.15 for a small bag and goes up in price from there. Even an extra-large (26 cups) seemed reasonably priced at $11.75! When to Invite Popcorn to the Party? Besides it being delicious, it's fun! There were several ways to have it packaged according to occasion. I saw that there were pre-made gift boxes of various sizes and even a section of nothing but popcorn balls at $1.50 each! 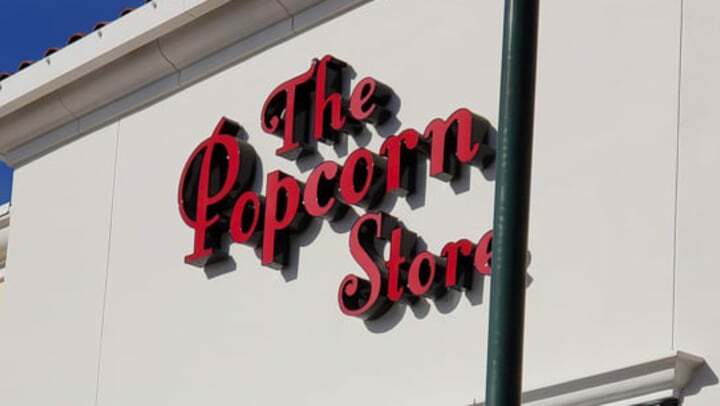 I saw that they (The Popcorn Store, not the popcorn balls) welcomed special orders for weddings, birthdays and other events. Imagine how fun it would be to have gourmet popcorn at a child's birthday party coordinated with the rest of the birthday theme! Or have a batch made for a work meeting that’s bound to be on the long side. Staff can enjoy a sort of guilt free snack and eat just a bit more of it (code for staying awake a bit longer) without feeling as guilty as if it was fudge or cookies. Move on Over to Popcorn! Here's a final idea for when to enjoy a special popcorn snack from The Popcorn Store…moving day! After a long day of moving your things from one place to another and making that last trip to your self-storage unit at Stanford Ranch Self Storage, you and your special helpers deserve a treat. 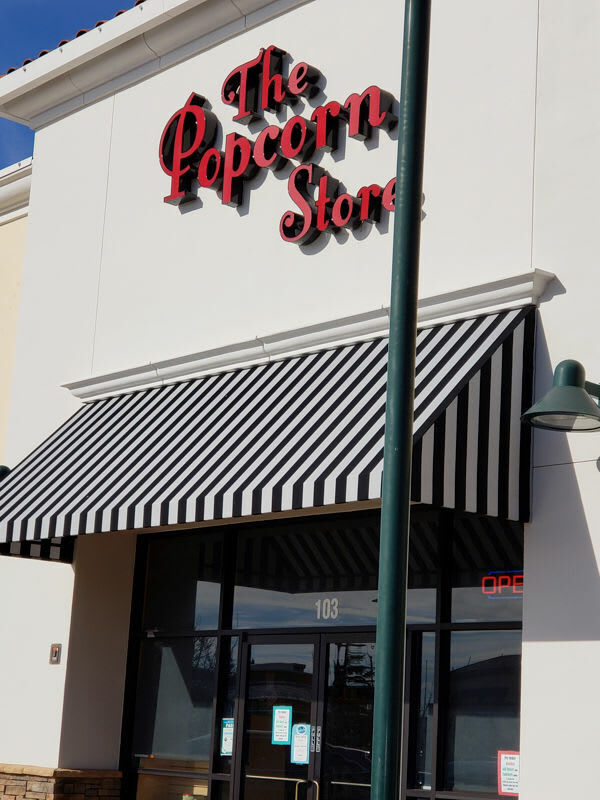 Why not fortify yourselves with several delicious flavors of gourmet popcorn by driving a mile down the road to The Popcorn Store! You and your special helpers will be glad you did it and trust me, you won't regret it! Happy popcorn trails to you!